Fans of flash gaming websites would know the name “Nerdook.” Nerdook is the name of the indie developer who have created a multitude of 2D platformers and strategy games for sites like Kongregate and Newgrounds since 2010. His 18 games on Kongregate alone are all highly rated and have reached 25 million plays in 2014. The pattern of recurring successes with each new game release has influenced the Malaysian native to quit his engineering career and follow his dream of making games. Earlier this year, the self-taught game developer announced that he would be switching his focus from flash games to indie titles. His first endeavor would be to revamp his 2010 platformer, Vertical Drop Heroes. From a first glance, Vertical Drop Heroes HD looks very similar to its predecessor upgraded to high definition, as the title suggests. Anyone who has played any of Nerdook’s games on Kongregate or Newgrounds would immediately recognize his unique graphics style. The simple 2D graphics are child-like and cute, and can be certainly appreciated by all age levels. But the high-definition upgrade is definitely evident; little details like a character’s hair shadow, for example, are discernible. Other minor details not found on the first game, like falling leaves and lighting effects, are also great additions. 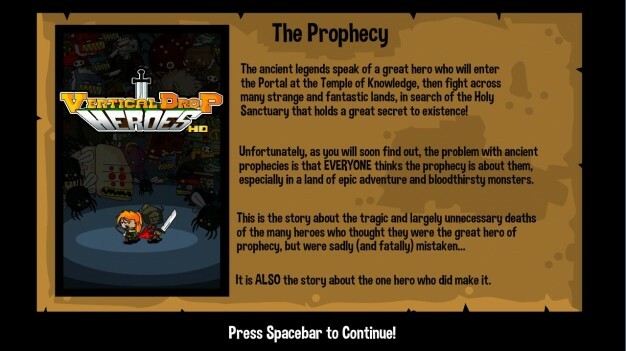 After starting up the game, it is evident that Vertical Drop Heroes HD is a completely new game on all levels. The first iteration of Vertical Drop Heroes was tailored as a role-playing (RPG) platformer game, where one character develops throughout the course of the game to save a princess from the clutches of evil goblins. 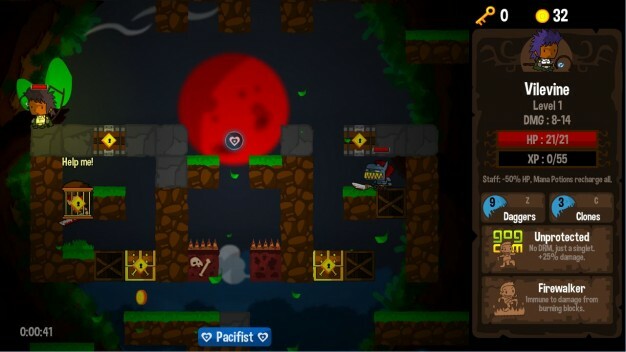 Vertical Drop Heroes HD, however, is more of a roguelike platformer, where the story is not centered towards saving a princess, but the journey of many heroes to find a holy sanctuary. In both games, the main point is simple: descend down to a portal, fighting hordes of foes, freeing caged heroes, and collecting treasures, gems, and gold along the way. Lighting effects are nice additions to this high-definition remake. The gameplay focus of Vertical Drop Heroes HD is very different. In the flash version, the main focus is to utilize the caged heroes’ abilities by assuming their roles after freeing them. Just like a typical RPG, abilities can be upgraded by spending gold. 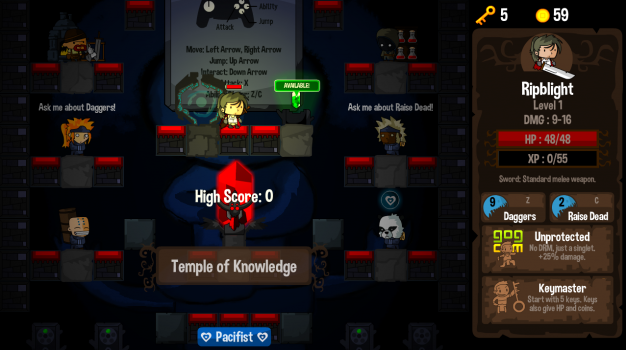 The indie version is a roguelike game where death is permanent. The main focus of the game is to upgrade abilities and statistics by spending gold collected throughout various playthroughs. The more you upgrade, the easier it gets to drop down to the portal for the next level. 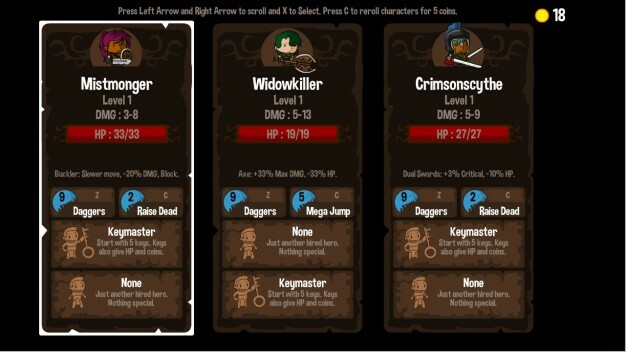 A typical game consists of selecting from three randomly-generated characters with different abilities and statistics. The selection can be refreshed by spending gold coins, but the abilities and statistics are limited by what upgrades are unlocked. The first ever playthrough will be the toughest; the selectable characters do not have abilities and their initial statistics are comparable to a dead stick. However, this initial playthrough will serve as a crash course to the game, introducing combat, exploration, and development. The focus of this game is not on saving a princess, but finding a holy sanctuary. The combat of Vertical Drop Heroes HD is simple: attack with weapons and skills and avoid by dodging and jumping. The game features an auto-attack option, where being in close vicinity to a monster will trigger a basic attack. All characters have two randomly-generated skills that are triggered by two buttons. These skills can be aggressive like shooting arrows and throwing daggers, passive like opening all locked items within a radius, and a combination of both like a “mega jump” that damages monsters and opens locked items at the same time. The skills are limited in quantity and can come in handy when monsters are littered throughout the level as well as the big main boss at the end of each portal, so conservation of these skills is critical. While the game can be played using the keyboard, it is highly recommended (even the game says so) to use a game controller. It is easier to have four dedicated buttons and an ergonomic directional pad with a controller than using three keys, the space bar, and the arrow buttons on the keyboard. Some levels demand a lot of maneuvering around and using the keyboard keys can result in unnecessary button presses that can certainly mean the difference between survival and death. Three randomly-generated characters can be selected every playthrough with statistics based on purchased upgrades. Exploration in the game consists of discovering treasures, non-playable characters (NPCs), and quests. With the main focus of the game being the upgrade of abilities and statistics via gold, levels are filled with coins and gems. Some are locked inside treasure chests that can be opened by keys. Keys are an important aspect of the game. Not only do they unlock treasure chests filled with gold and gems, but they also free caged NPC heroes that support your descent in the level. NPCs automatically attack monsters with basic attacks and skills of their own. Besides the hero NPCs, there are also quest-related NPCs that can generate on a level. These NPCs may be a king or a princess that requires saving the royal dogs or collecting flowers throughout the level. Quest-related NPCs will give tons of experience points and gold upon successful completion of the given quest. Shrines can be double-edged swords. There are also shrines all over the level that solidify the game’s roguelike elements. Shrines may be beneficial, dangerous, or both. Some shrines may give incentives such as invisibility or a temporary statistic boost. Some shrines may add more monsters in the level. Some shrines may give a temporary statistic boost in lieu of adding more monsters in the level. Shrines can be the one thing that can get you further down in a level or end the game in a second. 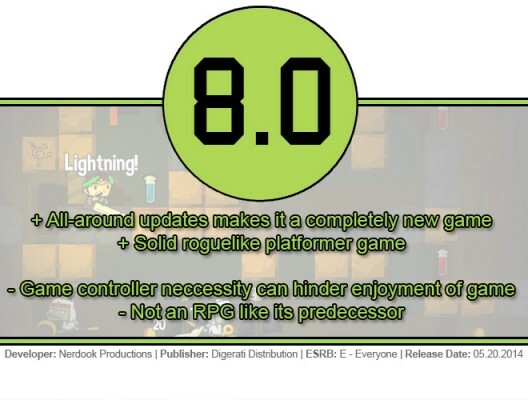 As mentioned several times previously, the main point of the game is to rack up gold and upgrade statistics and abilities for future playthroughs. There is a thing called “experience points” in Vertical Drop Heroes HD to give it the RPG flavor. Each experience level, of course, increases the character’s statistics in terms of health and attack, but not to the point that they will guarantee beating the whole game. The experience level statistic increases are highly dependent on the character’s beginning statistics and abilities that can only be upgraded via merchants. The game has three main merchants: weapons (attack range), potions (health), and abilities. Upgrading weapons and potions are done before starting a playthrough, whereas upgrading abilities (or finding new ones) are done via a quest-related NPC during a level. These upgrades are permanent and will carry on through the next three selectable characters in the next game. Attack and health upgrades are purchased via the blacksmith and apothecary. 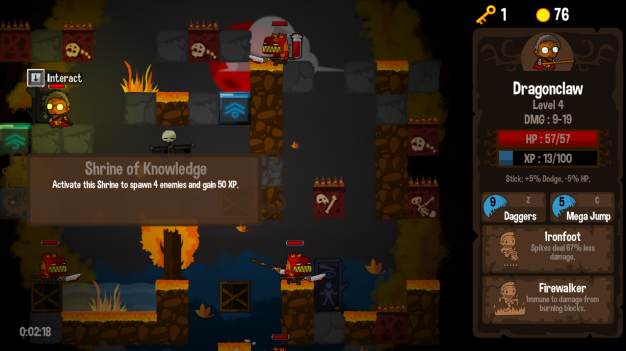 With so many elements in the game in terms of combat, exploration, and development, Vertical Drop Heroes HD is a solid roguelike game with RPG elements. Again, it is a roguelike game and not an RPG like the original flash game. Gamers who may be familiar with the flash game on Kongregate and Newgrounds and are looking for the same experience may be disappointed with the game. The main focus of the game is to purchase upgrades to get further in levels and not really to save the princess and finish the game. However, it is perfect for gamers who are into roguelike games and who also like platformers and RPGs. And of course, fans of Nerdook would certainly appreciate and enjoy this updated classic.